Dr. Cramin P. Wiltz II, DMD, CDT a Board-Eligible Prosthodontist and founder of Madison Prosthodontics that focuses on treating patients with the most challenging dental problems in the greater Huntsville-Decatur Metropolitan area of Alabama joins eHealth Radio and the Dental Care and Sleep Health Channels. Please tell our listeners how a prosthodontist differs from a regular dentist and who could benefit from your services? What is your advice to those of us that might be putting off extensive dental work? Maybe because of anxiousness. It is Better Sleep Month and lots of us suffer from a condition called sleep apnea. How can prosthodontists help and is surgery often required? You also perform a cutting edge procedure called All-on-Four solution. What is the procedure and how does it benefit patients? What are some other services you provide? Do you screen for oral cancer? Does one need a referral from a dentist to make an appointment with you and do you accept insurance? 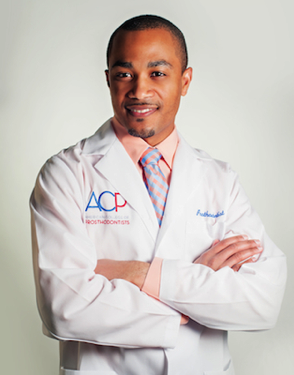 Cramin P. Wiltz II, DMD, CDT is a Board-Eligible Prosthodontist and Founder of Madison Prosthodontics that focuses on treating patients with the most challenging dental problems in the greater Huntsville-Decatur Metropolitan area of Alabama. As a prosthodontist, Dr. Wiltz is the expert in aesthetics, full mouth reconstruction, and teeth replacement options using dental implants (including the All-on-4 technique), complete dentures, partial dentures, crowns and bridges, veneers, and inlays/onlays. Dr. Wiltz maintains professional memberships with the following organizations: American Dental Association, Alabama Dental Association, Huntsville-Madison County Dental Society, American College of Prosthodontists, Southeastern Academy of Prosthodontists, Academy of Osseointegration, National Board for Certification in Dental Laboratory Technology. Student Leadership Award, The Alabama Dental Association Professional and UAB President's Diversity Award.